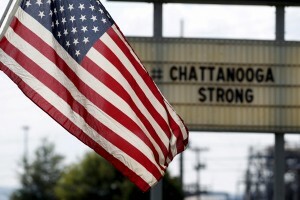 The family of Mohammad Youssef Abdulazeez, who is accused of opening fire at two military facilities on Thursday and shooting five people in Chattanooga, Tennessee, has released a statement expressing condolences for the victims and their families, The Associated Press reported Saturday. “There are no words to describe our shock, horror, and grief. The person who committed this horrible crime was not the son we knew and loved. For many years, our son suffered from depression. It grieves us beyond belief to know that his pain found its expression in this heinous act of violence,” the family said in a statement provided to the AP. Abdulazeez, 24, first opened fire on Thursday at a recruiting center in Chattanooga, then drove several miles to a Navy and Marine reserve center, where he shot and killed the Marines and wounded the sailor, who died of his wounds on Saturday. Abdulazeez was shot to death by police. Abdulazeez is believed to have been born in Kuwait, although it is unknown whether he was a U.S. or Kuwaiti citizen. The shooting is being investigated as an act of domestic terrorism. It is believed that the Abdulazeez acted alone, and lived in the area. The family added that it is cooperating with the investigation, the AP reported.